Eco-driving means optimising driving performance for a safer, more economical and environmentally-friendly driving. The ACTUATE project aims to help optimising the driving performance for vehicles in the public transport sector that are considered clean (such as hybrid buses, trams, trolleybuses with or without supercaps). ACTUATE offically started on 1 May 2012 and runs for 30 months spending its total budget of about 1.6 mln Euro for the provision of a range of information material on safe eco-driving of electric bus and tram fleets. This includes a starter kit as well as free e-learning courses for safe eco-driving for the four defined types of electric vehicles. ACTUATE will also develop dedicated driver training concepts for trams, trolleybuses, hybrid buses and trolleybuses with supercapacitors as well as "golden rules" for safe eco-driving in general. 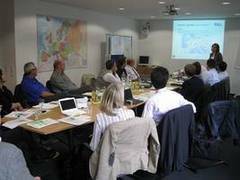 The picture shows representatives of all nine project partners during the project's kick-off meeting on 4 and 5 June 2012 in Cologne, Germany.